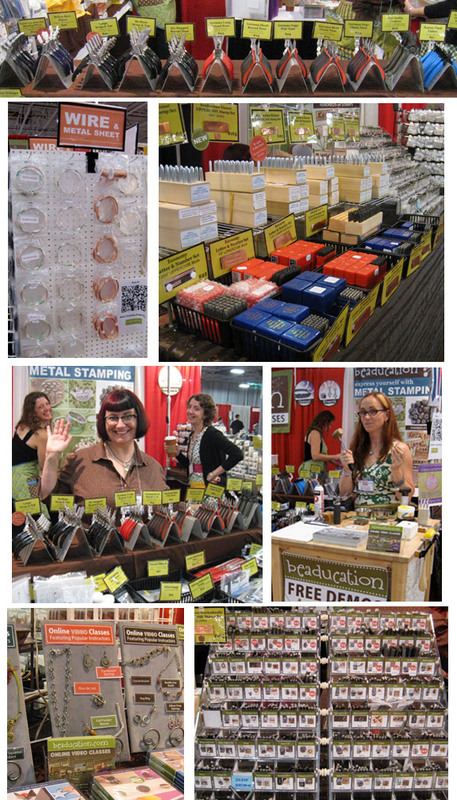 Beaducation: The Blog: Bead Fest Philly wrap up! 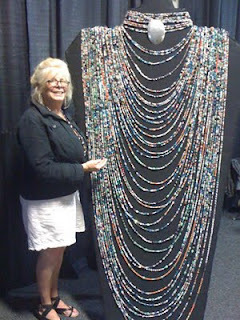 Bead Fest Philly wrap up! SUCCESS! 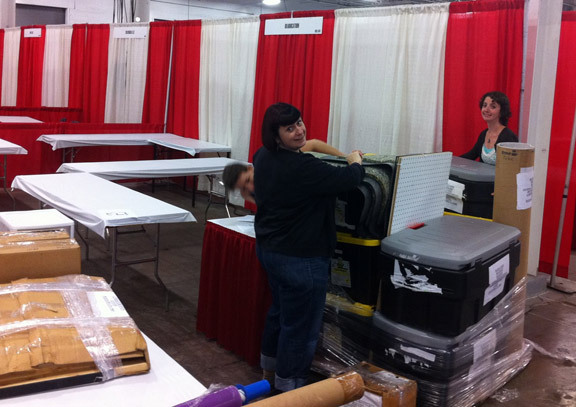 Another great Trade Show done and done: Bead Fest Philly. That's a wrap. There is a lot of work that goes into these shows; before, during and after the show. The booth transformation is quite amazing. Colin is blurry because she moves so darn fast. That girl does not stop! These shows are a lot of fun. It's a great opportunity to hang out with our customers, face to face, and teach them all they ever wanted to know about our classes, tools, stamping tools, and jewelry making techniques. One thing we love about this Philly show in particular, is seeing the lovely Maryann Corey from The Portable Playhouse. This is a great organization which brings art and jewelry making into Pediatric Units in hospitals. Here she is to the left, with their gigantic necklace. They are shooting to make the world's longest beaded necklace for the Guinness Book of World Records. Overall, show-goers in Philly were so kind and charismatic that our only complaint was that our time was too short. Packing up was a breeze because we were left with very little to pack! Tumblers disappeared the first hour of the show and our new design stamps were a hit. We are already excited about our next show BABE in Oakland and of course can't wait until next year in Philly where we never get enough cheesesteaks, Hoagies, soft pretzels and kind customers who keep up comin' back each year. Hi Lisa & the gang...it's my dream to one day b at one of these shows, i would love to also say thanks so much for everything and your OUTSTANDING customer service!! It looks like you had so much fun. I hope one day to make it to a show where you all are showing at. I'd love to see your items in person and meet you all. I love your site. It was definitely good to see you all!